Diablo III's Expansion Pack Named - "Reaper of Souls"
Blizzard has just put up a "Reaper of Souls" teaser site on its Diablo III domain. Well we can scratch the first Diablo III expansion pack off that list of possible things that "The Dark Below" trademark we saw pop up earlier could be, as it now appears Blizzard has outed Diablo III's expansion pack's name: "Reaper of Souls". Keep in mind this isn't 100% official confirmation, but considering that Reaper of Souls is a registered Blizzard trademark that has just gone up as an official Blizzard Diablo III domain, there's little room for speculation. Simply put, unless it's some kind of Diablo III tablet spin-off (but who would be stupid enough to do that? Oh right...), we're looking at the first teaser for the game's first expansion pack. "Death, at last, shall spread it's wings over all." From the book of Tyrael. With Gamescom coming up next week, it seems like Blizzard will be spilling the beans there. Blizzcon 2013 isn't until November, and while it is usually where Blizzard makes its big announcements, it seems a bit too far off to be dropping teasers this early. 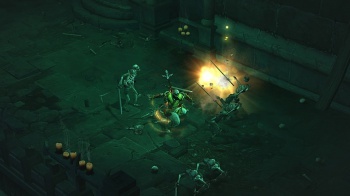 If Blizzard is prepping the expansion, it explains a lot about why things have been so quiet on the Diablo III front. Full PvP, which was promised shortly after launch, still hasn't been patched into the game. All we've gotten is a vastly watered down teaser - "Brawling" - with Blizzard promising "proper" PvP "soon". Needless to say, I would hope they at least deliver the features they promised with the vanilla game before the expansion hits.